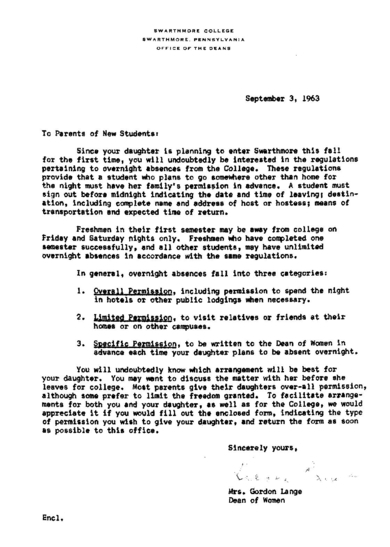 Here is a copy of the letter Chickie found that was sent to her parents her freshman year. While it was originally posted in the Announcements section, there is no opportunity for discussion there. (I am still learning the ins and outs of how to use this site.) With a little work, you should be able to read the letter. Of interest is that Barbara Lange signed her name, Mrs. Gordon Lange. She became Barbara Lange not long therafter. How things did change in the world during our four years at the College!